Two internships. Two students. One passion. 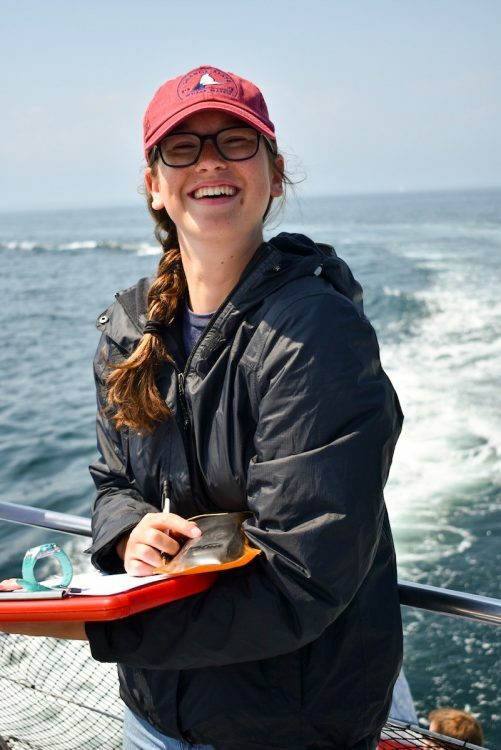 While Libby Exline ’19 was spending her summer in the warm, turquoise water snorkeling and scuba diving as part of field study of the coral reefs off the Turks and Caicos Islands, Kati Biggs ’18 was 1,500 miles away on a boat in a completely different environment, studying whales for the New Hampshire-based Blue Ocean Society. 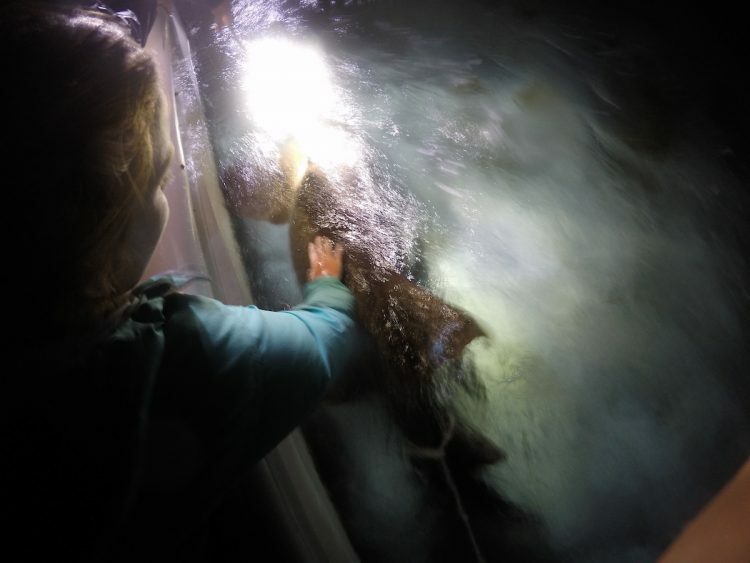 Though their internship experiences were vastly different, both women had the opportunity to conduct research related to a shared passion: the ocean. 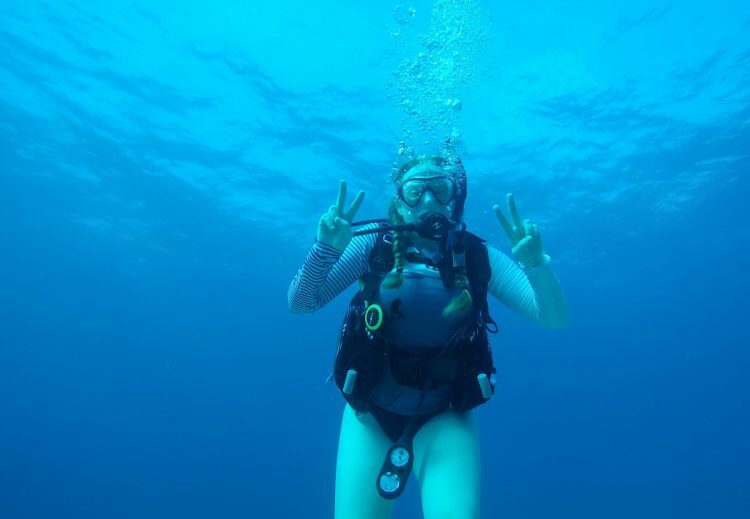 Libby Exline ’19 scuba diving off the coast of the Turks and Caicos Islands. Growing up along the shore of Maryland, Exline has always been fascinated by the water. That curiosity about marine biology has led to some exciting opportunities—most recently, the Turks and Caicos field study. 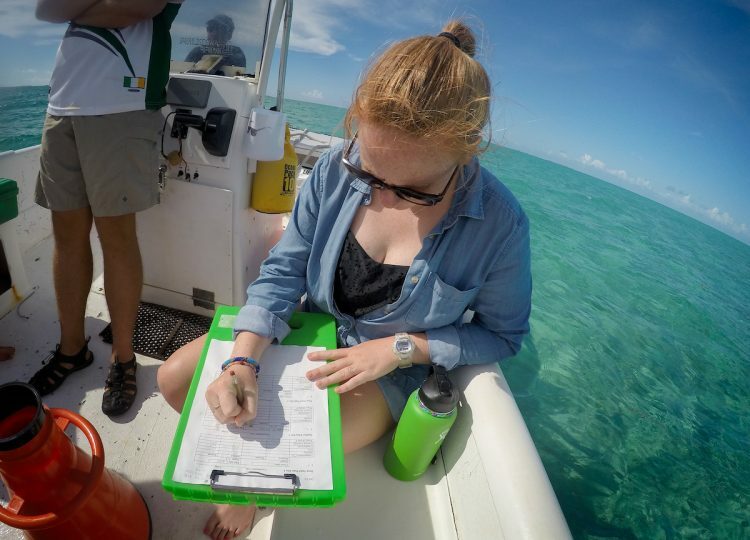 Exline’s summer in South Caicos was part of the School for Field Studies Marine Resource Studies program. 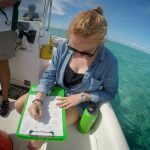 Alongside students from all over the world, Exline studied and collected data about seagrass beds, mangrove forests, and coral reefs. Snorkeling and scuba diving were only part of the fun. Exline found out about the opportunity from her environmental studies professors, who encouraged her to apply. Though Exline jumped at the opportunity to study abroad, she experienced some culture shock when she arrived in the Caribbean. The island was unlike the crowded beaches and numerous tourist activities for which the Turks and Caicos Islands are known, and she felt somewhat isolated at first. However, it didn’t take long for her to realize the 8.5-square mile island was a perfect setting for research and making new friends. The School for Field Studies program was not the first time Exline wore a scuba suit for research. Before leaving for her internship, she participated in a Summer Research project with Tyrah Cobb-Davis ‘19 and physics and environmental studies professor Sarah Sojka. The group worked to restore seagrass beds along Virginia’s shores. She was also able to use a Randolph Innovative Student Experience (RISE) program grant to help fund her South Caicos trip. 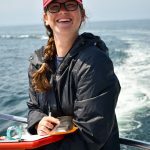 Kati Biggs ’18 (left) collected data aboard a whale watching boat during her internship for the Blue Ocean Society for Marine Conservation. 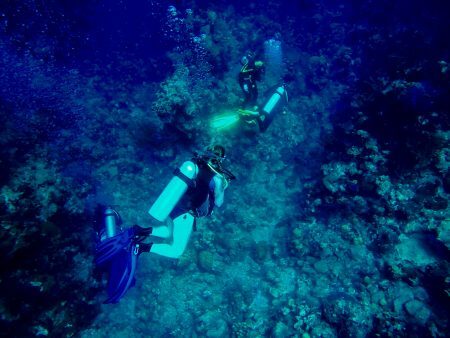 While Exline was in the Caribbean with the coral reefs, another Randolph student was making waves with her research on whales and marine conservation. 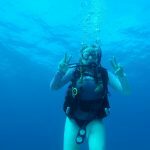 Kati Biggs ’18, a biology major, completed an internship for the Blue Ocean Society for Marine Conservation. 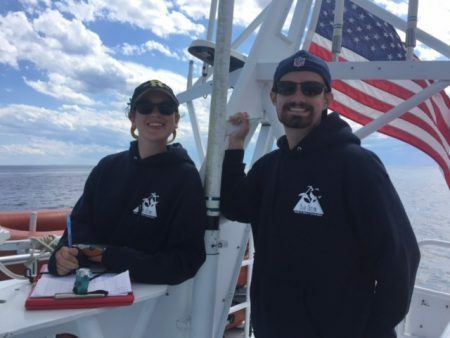 Based in New Hampshire, the Blue Ocean Society is a non-profit organization whose mission is to protect marine life in the Gulf of Maine through research, education, and inspiring action. 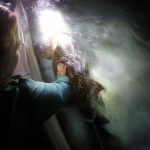 In her role, Biggs assisted primarily in educational outreach and in collecting data on the location and behaviors of marine life and ocean debris. For the educational aspect, Biggs accompanied citizens and tourists on whale watching expeditions four times a week. While on the water, she provided information about the area and its underwater inhabitants and answered questions from the public. Biggs found that she was well prepared for the internship. Biggs came to Randolph planning to study neuroscience or molecular biology, but she changed her mind early on after taking a zoology course. Now, she plans on a career in which she can help preserve habitats for animals threatened by pollution and human activity. During the internship, Biggs lived in Portsmouth, New Hampshire. On days off, she took advantage of the many activities the city had to offer, including trips to the beach and to the Acadia National Park. The internship was funded by the Marnie Reed Crowell Summer Scholarship in Field Biology as well as a Jolley Mini-Grant.